The bed is the most important portion of a bedroom where people spend most of their time to rest and recharge their energy. But when it comes to beds that are specifically for heavy people, there are some things that just don’t work out over time. One of the biggest concerns of people that are on the heavy side is the bed frame. Ordinary and cheaply made bed frame for heavy person simply can’t last long. It’s not the sagging mattress in the middle part of the bed, it’s the bed frame that usually collapses. So here, we’ll help you save the time to find the best bed frame for heavy person. Zinus 14 inch Elite SmartBase is perfect for big and tall people. No more box springs because this bed frame has a built-in support already that you’ll surely love. You don’t even need to use tools in order to assemble it because it’s designed to be folded. Whenever you need to put it into storage or bring it to camping, you can easily carry it without the hassle of reassembling it. Once settled, you can already roll over it and put your mattress without hearing any noise. Zinus 14 inches is available in Twin, Twin XL, King, Queen, and Full sizes which also makes is as one of the best bed frames for heavy couples. This steel frame weighs 59.5 lbs. and can hold up to 4,440 lbs. in its 80 x 76 x 14 in. dimension. Aside from the fact that it is easy to assemble in spite of its great support, it doesn’t contain protruding parts that can cause knees and toes injury. The frame’s bed slats have 5 ¾ spaces in between so you don’t have to worry about a sagging mattress in the middle of the night. Lastly, it offers a 5-year warranty. Want one of the classic brands? 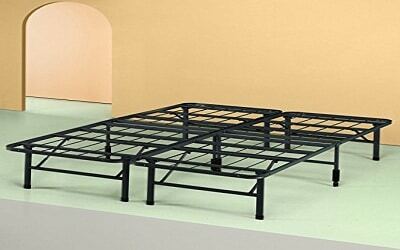 Then Hercules Heavy Duty 14 inch Platform Metal Bed Frame might be the one you are looking for. For years, Classic Brands has been known in the market to provide high-quality products like Hercules bed frame. This metal bed frame with smooth black finishing is designed to give an extreme support on flat surfaces aside from supporting various types of mattresses in the market. With offered supreme support, Hercules Heavy-Duty Metal Bed Frame is excellent with or without using a box spring. You can also use it with footboard and headboard since it features built-in various bracket supports that are sold separately. Available in all sizes, this metal bed frame offers a 3-year warranty. In addition, it is also easy to assemble or to carry around since it’s foldable. 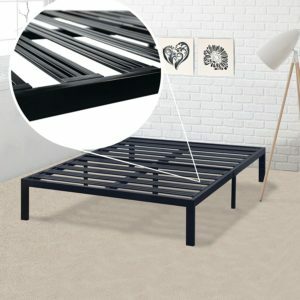 When it comes to marks that bed frame legs usually leave on the floor, don’t worry because its package includes caps to keep your floor from scratches. There’s no need to bother using tools when assembling this metal frame which is made of pure steel from its major metal frame up to its thin wires for more comfort and support. Known as one of the best bed frames for heavy people, Olee Sleep 14 in T-3000 Heavy Duty Steel Bed Frame is clearly sturdy and ready for the job. From its smooth design to its pure steel slats, you can never doubt the support it can provide under your mattress. 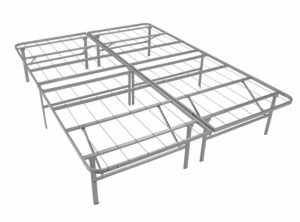 This steel bed frame is the perfect partner of various mattresses especially deluxe mattresses to provide extra comfort on the body. With its sturdy and thick steel frame, you can just lay your mattress directly on top of it even without a box spring. With a 5-year warranty, this easy to assemble jet black bed frame can last for years in your hands. With a 75 x 54 x 14 in. dimension, Olee Sleep T-300 weighs 44.3 lbs only. Its smart design makes it perfect even for small spaces to give superior support together with its steel brackets that can be folded. It doesn’t wobble too when you sit or lay down on it. However, its slats are 7.5 in. apart so you might feel more comfortable to lay plywood under your mattress if you prefer a latex mattress without a box spring. Do you want a durable and high-quality bed frame with fewer slats and wires on it? 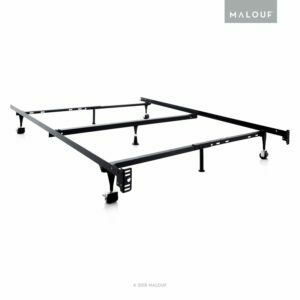 Well, you’re lucky because Malouf Structures Heavy Duty Adjustable Metal Bed Frame can give you just what you want. If you want to skip on the hassle of assembling just like what most people want, what you need is a tough bed frame that needs less effort to assemble. In other words, you need Malouf Structures bed frame with fewer slats and parts to set up. With only 7 legs, 1 on each corner and 3 in the middle, you can easily assemble and adjust its metal bed frame without a sweat. In less than an hour, you can already enjoy a fully functional bed frame without using any tool. No need to worry about the sizes since you can have all Queen, Twin XL, and Full XL sizes by expanding it. Just roll the frame and lock it according to your desired size which saves you a lot from purchasing another with different size. It weighs 29.1 lbs. in a 23.7 x 23.7 x 2.8 in. dimension. However, you will need a thicker mattress to match its design. Coming from a well-established brand, Kings Brand Furniture Bed Frame is ready to prove itself in the market as a sturdy and reliable product. Weighing 25 lbs. with a 70 x 60 x 7.5 in. dimension this bed frame is perfect for any kind of mattress you want to use. May it be a Twin, Full, or a Queen sized mattress you don’t have to worry about having a tough support under your mattress. You can even set it in just 10 minutes! 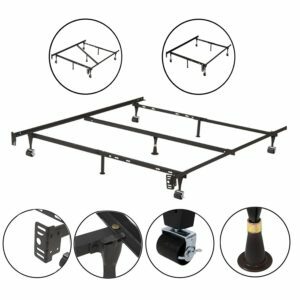 With an additional center support rug rollers and locking wheels, the stability of the entire bed frame is improved to support heavy people. Its simple but smart design is ideal for those who really care about the products’ stability. Just like the other mentioned bed frames above, this metal bed frame is hassle-free to assemble without the need to use any tool. From one look, it is easy to say that you can move it anywhere you want without a problem because it has wheels to help you. Aside from being one of the best bed frames for overweight people, its metal frames come in handy too because of its health benefits. Another premium bed base from Mantua, Mantua Premium Platform Bed Base is certainly not the least for it is widely known as a durable foundation for all types of mattresses. As a matter of fact, you can already say goodbye to your box springs once you purchase this product. It already got the necessary supports that can hold even those who are on the heavy side. 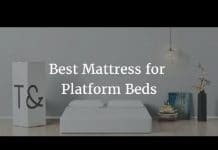 You can already save a lot from purchasing a box spring since most modern mattresses will be just fine with Mantua Premium Platform. With its 80 x 54 x 14 in. dimension, you can maximize its 14 off the floor inches extra space for storage. What’s more, it only weighs 38.5 lbs. so it is very easy to carry and set up anywhere you want it. Once you’re done assembling it, you can use already lay your mattress on it or you can put it inside your old bed frame to support your mattress better. It’s perfect for a box spring replacement and a wooden bed partner. It is also available in Twin, Twin XL, Full, Queen, King, and California King sizes in a silver steel finish. From its name alone, you can already tell that you are in for an affordable product. Best Price Mattress Model E Heavy Duty Steel Slat Platform Bed Frame has a modern but simple design which is perfect for minimalists. With 100% steel construction, you don’t have to doubt its durability since Best Price Mattress prides itself on offering a superior support and stability to customers. Whether you have a huge or small budget, this can certainly give you the comfort and support you need. 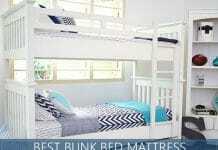 Its sturdy slats are made of steel to provide an unbeatable support and avoid a sagging mattress. You can even extend the life of your mattress by using this platform bed frame. Unlike other bed frames with only 4 legs, this platform bed frame contains 7 legs support the middle part better. Thus, you don’t have to worry about waking up with a broken bed frame or a sagging mattress in the middle part. Assemble it even without tools, it only weighs 49.8 lbs. and with a 79.9 x 9.1 x 9.1 in. dimension, you can use its extra space underneath as storage. You can also enjoy its 5-year warranty. If you consider yourself heavy then getting a decent bed frame to support your bed is very important. Aside from having a good bed to cushion you, having a good bed frame can also give you a more comfortable spot to rest by elevating your bed. The best bed frames for overweight people can also add some color and décor to bedrooms. But if you feel a bit lost on where to start searching, here are some important things to consider before you buy the good bed frame for heavy people. Be sure to know the exact size of the room where you’ll place the bed frame since it requires sufficient space to fit inside. So technically, it’s not ideal to buy a huge bed frame if your room is small because it will eat up most of your room space. In addition, you won’t be able to make the most of your bed frame if it will ruin the overall look of your room. To maximize your bed frame, it’s better to get a bed frame with storage options which can be hidden under the covers or as a drawer. The bed is always the center of attention in every bedroom but getting the best bed frame for fat person should never be neglected. Wooden bed frames are known for creating a warm feeling that is very welcoming. Whereas metal bed frames are known for creating a modern look. Thus, it is vital to know the exact type of bed frame that suits your taste and preferences. You can also improve the look of your bed frame by matching it with your bed sheets and pillow sets. Bed frames can be made from many materials but the most common materials used are wood and metal. In fact, wooden bed frames are quite popular because of the versatility and durability it offers. Whether you are into modern or traditional style, wooden bed frames in various shades can be designed to suit your taste. But if you want your bed frame to look more sophisticated, metal is a great option. Bed frames made from metal are known for sturdiness. You can choose from various kinds of metals to add strength and style to your frame. Once you know the size, design, and materials that you want on your bed frame, it’s time to find out where you can order one. There are hundreds of bed frames that are available in online stores and physical stores that you can check out. However, you should also keep in mind your budget before you purchase a bed frame without sacrificing its quality. You can order a ready-made bed frame or a customized bed frame to suit your needs better. When chosen right, you can have a high-quality and attractive bed frame that can support you for years. Getting the best bed frames for heavy person requires more time and considerations to get everything at the right place. Aside from the factors to consider before buying a bed frame, it is also important to find the right guide once you are ready to buy. Whether you just want a single bed frame or the best bed frames for heavy couples, this guide will help you shop the right one for you. Though you might consider buying a bed frame that suits your budget never compromise quality with a cheap bed frame. Sure, there are tons of bed frames out there that you can choose from according to your needs and budget. But cheap items are always next to inferior quality which means low weight capacity. The main reason why regular bed frames and platforms don’t suit heavy people is because its weight limit can’t hold them. Aside from you, other individuals might use the bed which will be supported by your bed frame too so its weight capacity is important. Especially if you are not the only one who is overweight in the house, you need to estimate the overall weight capacity that the bed frame can hold. You have to be smart especially if you are on a tight budget and you want to buy a bed frame online. Though online shopping offers a lot of conveniences, it can be a little challenging as well to inspect the bed frame you want to buy. But then again, online shopping can save you more time on searching if you read honest customer reviews. The more expert’s review the better. Reading through customer reviews can give you helpful insights. Aside from the price, one of the first things you need to check is its toughness. Wood bed frames are tough but if you are not sure of the materials that were used in the product, it is always safe to go for a metal or steel bed frame. 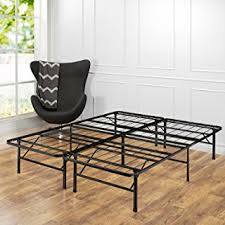 Steel bed frames may not be the most attractive ones but it is certainly known for being reliable and tough since you are looking for a heavy duty product. For an extra assurance, look for metal brackets and other reinforcements. Getting some rest isn’t just about having a spot to take a nap or long sleep. Getting some rest means getting a nice bed on a nice bed frame to keep you safe and sound while you’re having an adventure in the dreamland. Part of being responsible means thinking of everyone’s safety especially in the bedroom. We have our own taste which is why bed frame manufacturers keep on finding new designs and innovations to please customers like you. It is always smart to invest in quality things like bed and bed frames. After doing some research and consultation, you’re good to go.